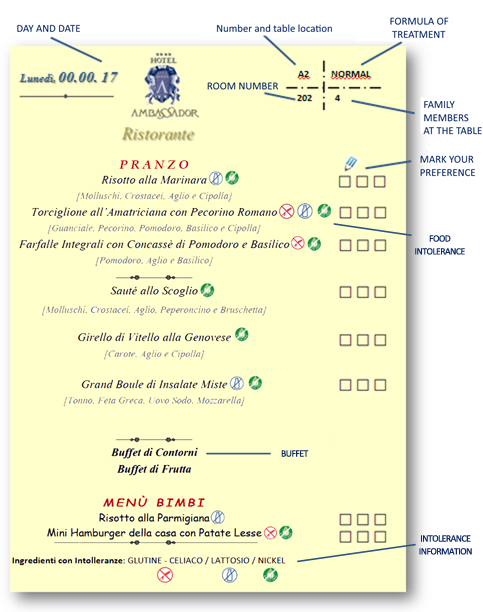 the reason that drive us to publish the restaurant service included in the full board treatment , is on one hand to help the guest to have information as possible on the contents of the menu of summer holiday, to the other hand to understand the structure, the backstage of our restaurant service, where you often receive informations difficult to memorize and perhaps enhance the choice of a hotel. 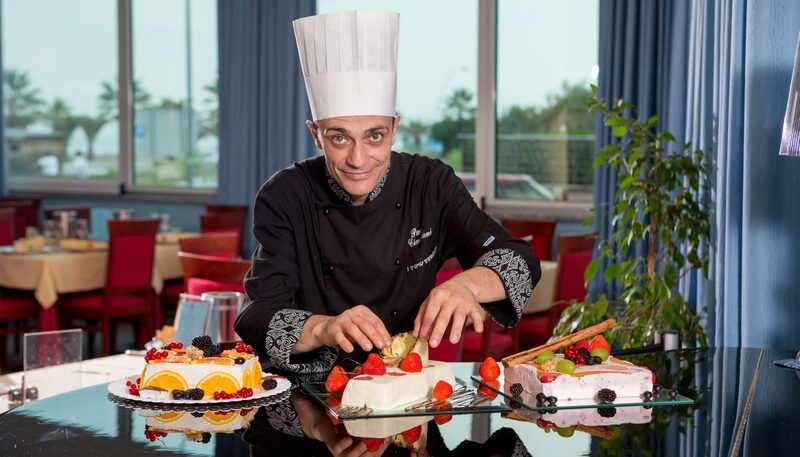 Follow a further description of the restaurant "Full Board"services: the Grand Buffet Breakfast; the Lunch Menù and the Dinner Menù; the Side Dishes and Appetizers Buffet; the Fruit Buffet; the Desserts Buffet and from 2017 also the Ice Cream; to finish also the Kids Menù. Gran Buffet Breakfast: the day begins with breakfast in the large and comfortable breakfast room facing the sea with annexed terrace where you will find more stations in our buffet consisting in addition to the traditional packaged breakfast products, the homemade pastries prepared by our Chef Patissier Gabriele, with jam tarts, fruit cakes, chocolate cakes , with almonds and yogurt, with candied and fruit plumcakes and traditional milk biscuits. Upon request, for gluten and lactose intolerants, breakfast will take place at the table with specific products, however for the wholemeal and light pastry you will find a dedicated station. Great attention is given to the bread buffet where you'll find white bread rolls, whole meal bread, rye bread, 5 cereals, and white sliced bread that you can toast with the useful roller-toaster. The American breakfast follows with sausage, ham, omelets, scrambled eggs, bacon, cheese slices and useful egg-boiler where you can choose how to cook your eggs. The coffee service consists in the “Bouvette” manual distributors of milk , barley, coffee and juices and also vending Nescafe quality. 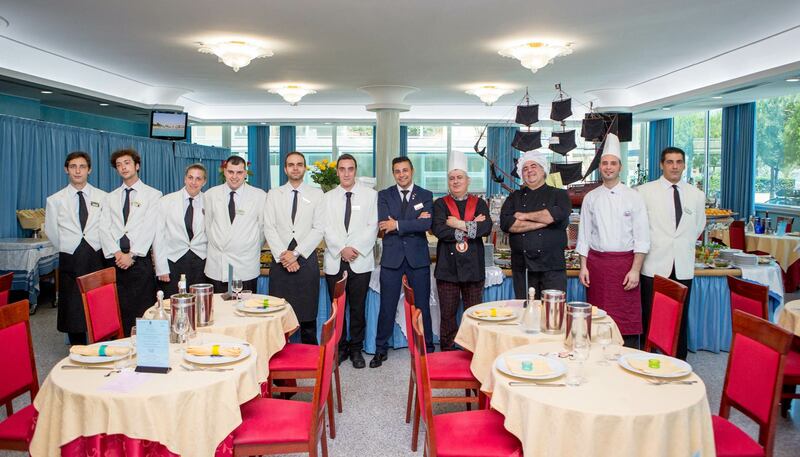 Our staff, directed masterfully by our Maitre Francesco, is always careful to reorder and replace the buffet, is always available to serve the steaming coffee and cappuccino from the bar at no additional cost, and to offers you every morning, fresh milk or organic, lactose-free and also soya milk. Lunch Menu: a choices of 3 first courses cooked by Chef Entremetier Khamlich Ahemad, one fish based , one meat based and the other based light or low calorie with vegetables and whole wheat pasta or cereal; 3 second courses choice cooked by Chef Claudio and Saucier Chef Garde-Manger Carlo Messere, one portioned or steak baked fish or stewed; one of red meat and the other white meat, with cooking baked, stewed or grilled. Dinner Menu: a choice of 3 first courses, one fish based mostly with daily home fresh pasta, another fish based but soup and the other meat based . A special feature of note are our soups especially fish soups, because of their delicacy of flavors represent the restaurant's strong point. 4 second courses choices, a portioned fish, filleted, fried or battered in tempura; one meat baked with ancient recipes national and international flavors, the more traditional grilled and always with extra virgin olive oil and finally a delicious and tasty dish that meets the taste of the moment. 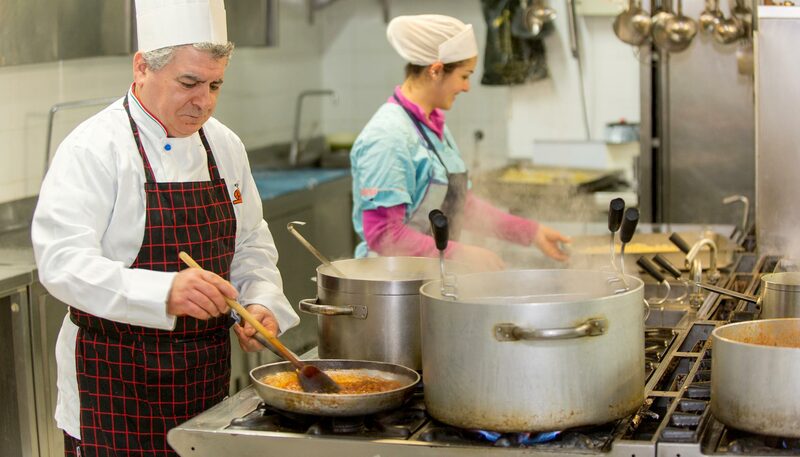 Please click on hats chefs to display the menu suggestions. 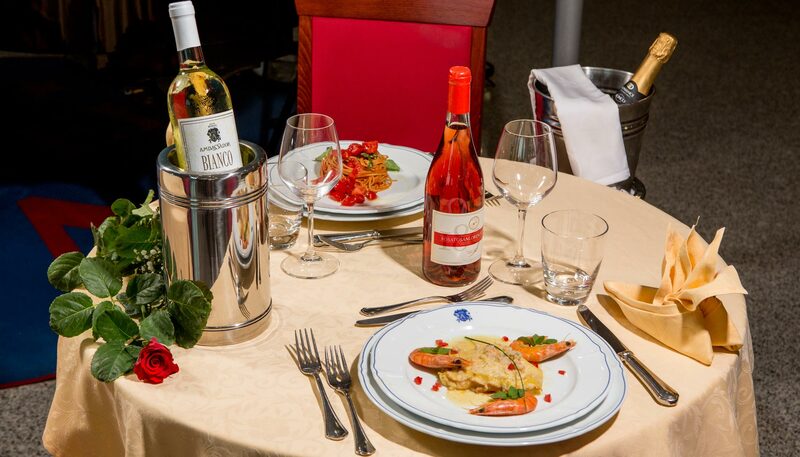 * The above menus have a rotation of 8 days that you will find on your table the day of arrival in order to choose between 3 first courses and 3 second courses your favorite dish. The day of the arrival for organizational reasons the menu will be fix. The Full Board starts with lunch on the day of arrival and finish with breakfast on departure day, if you arrive with dinner you can have lunch on the day of departure. The meals not taken on the Full Board are non-refundable. 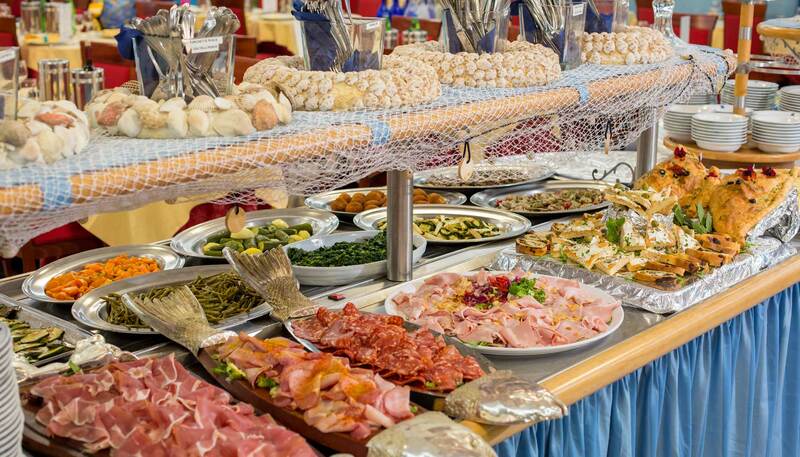 The Garnishes and Appetizers Buffet: is placed in the central zone of the main restaurant near the Bread Buffet that consists of bread sliced white bread, whole wheat bread, rye bread, bread sticks, salted crackers and no salted and in addition also croutons in the presence of soups. The Buffet is cured by Chef Garde-Manger Alessandro, for lunch he prepares cold vegetables, salad leaves or red salad, mixed legumes, vegetables flowers and vegetables, along with steamed vegetables, grilled and au gratin, ratatouille vegetables, fabulous potatoes pies and finally the rustic pizzas. All made more unique and different cooking and seasoning. 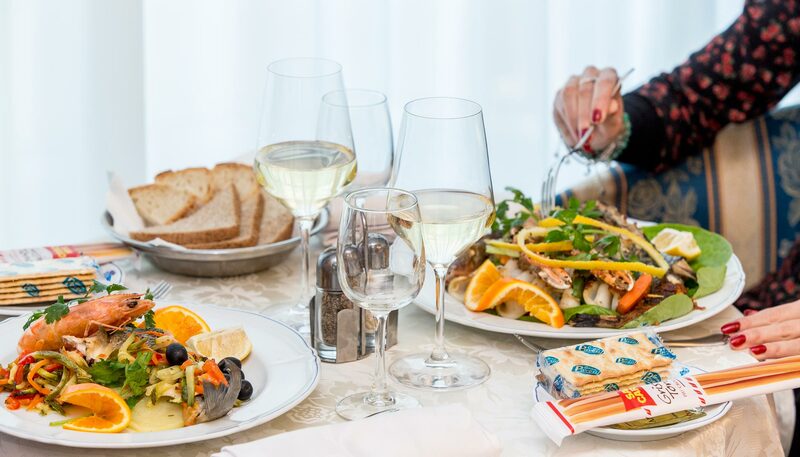 In the evening, the Side Dishes Buffet is enriched by appetizers with a large selection of red and white meat smoke house made , a choice of cold cuts and fresh or seasoned cheeses, tasty and varied pizzas by slice, fritters, panzerotti, mixed assorted fried and battered vegetables. The Dessert Buffet: curated by Chef Patissier Di Trizio Salvatore presents a selection of ice cream at lunch and even for dinner along with dessert pastries always different and assorted: Black Forest Cake, Sacher Cake, Bounty Cake, Millefiori Cake with Chantilly cream and delicate cream profiteroles; Mignon Pastries with fruit and Dry Pastries; desserts like Panna Cotta, Chocolate Mousse and Parfait; also the modern Finger-Food and the classic Tronchetti pistachio and nougat taste. From 2017 season tasty ice cream for lunch. Special mention also for the local Abbruzzo pastries with Sfogliatelle, Calcionetti, Parrozzo and Sassi d'Abruzzo. All it served exclusively by our staff. 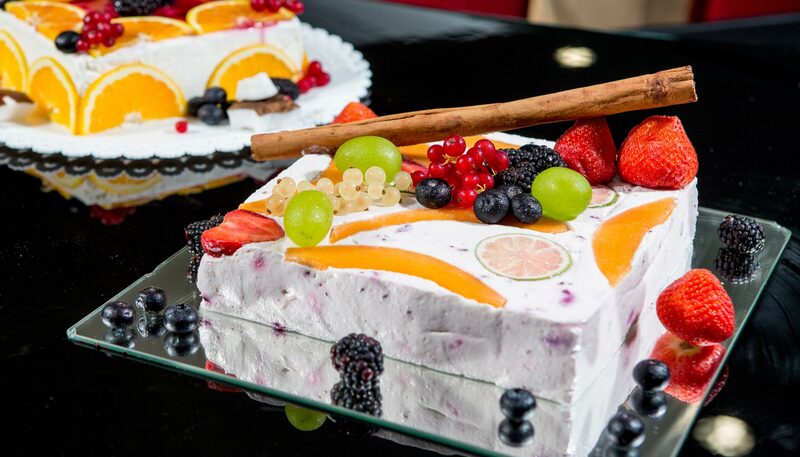 The Fruit Buffet:is largely seasonal and exotic always gourmet presented because is easy to consume, trays fruit tree, soft fresh fruit salad, canned fruit and steamed fresh fresh fruit expertly prepared from Maître Francesco. 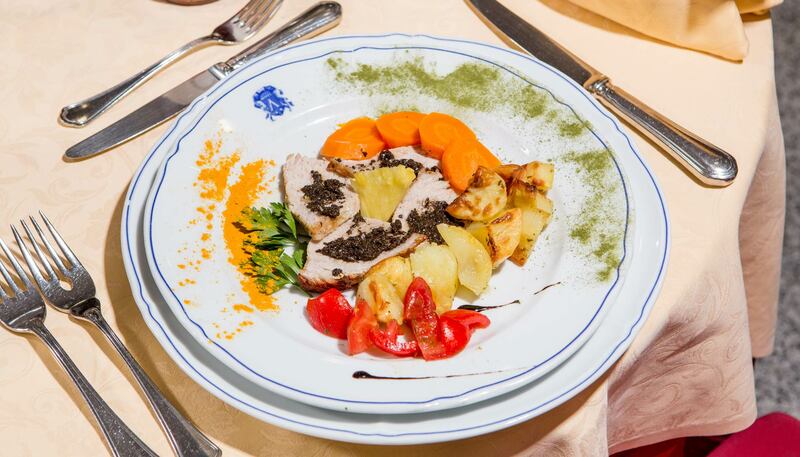 All it served exclusively by our staff. Kids Menu: special kids menu is designed with healthy and tasty dishes, calibrated on the nutritional needs of children but irresistible and appetizing, with special attention to the color of foods, nice special sizes pasta and very little spicy with table set with dedicated place mat, plates, cups and colored flatware. We look forward for your opinion.